What is the ideal weight for a miniature schnauzer? 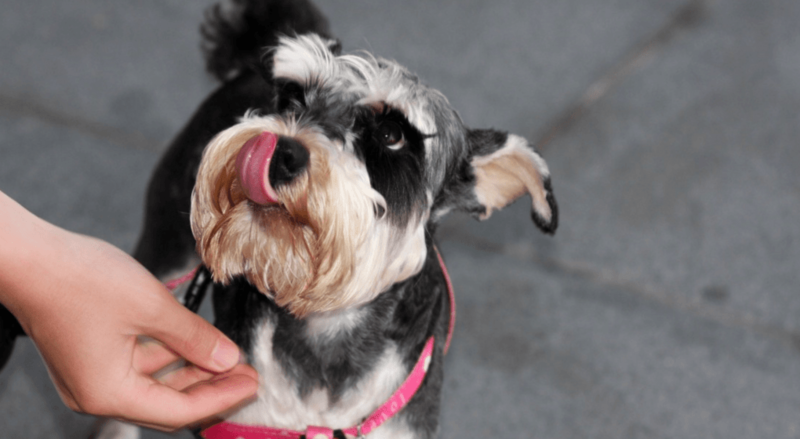 How Many Times a Day Should You Feed a Miniature Schnauzer? What human food can they eat? Are There Healthy Treats Available? You’ve probably heard that you shouldn’t feed your dog with human food often. Why? Simply put, the food we eat doesn’t have enough of what our dogs need regarding nutrition. 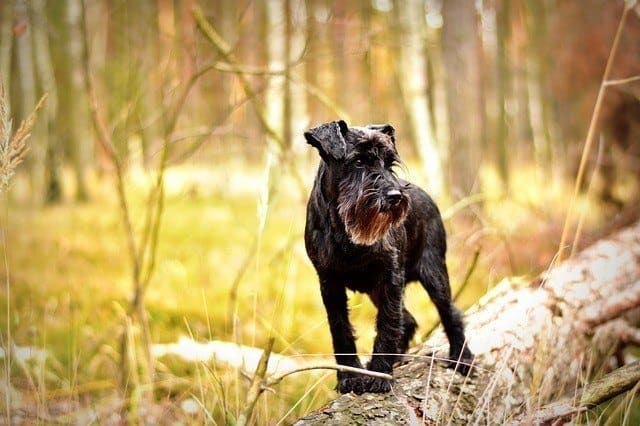 Miniature Schnauzer owners usually struggle to find the best food for this breed. It’s the smallest of the three Schnauzers and entirely different from the other two breeds. For this reason, it can’t eat the same type of food. These friendly and trainable hounds are great family dogs. However, they need high-quality food to maintain their healthy lifestyle. These dogs are active, tough and muscular, so they need a specific diet and nutrition in order to grow healthy and happy. 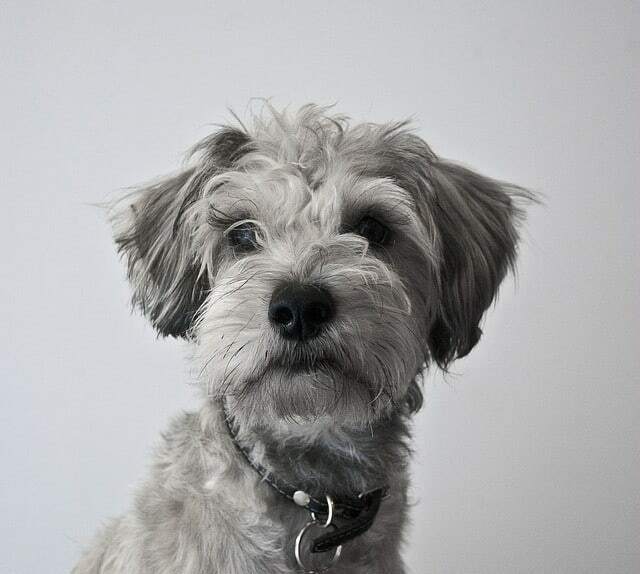 We’ve done some research on miniature schnauzers and what is the best food for them. Continue reading if you’re having trouble with your pup’s diet as we’ll discuss what’s the best for its nutrition and health. Miniature Schnauzers are active and muscular so they require a diet that can provide enough nutrition for such a lifestyle. Since every breed is different and so is every individual hound, it’s crucial you consult your vet. A professional is the best to advise you on what kind of food your pup should eat. However, if you have a healthy and happy dog, you can simply follow some general guidelines when choosing the right meal. These canines need protein and fats, but since they’re prone to obesity, you want to keep their calorie intake under control. This also means you should limit the use of treats to only when they are necessary. Now if your vet recommends that your dog needs to up their calorie intake, then you might want to read our high calories dog food guide. Below you’ll find all the essential info on how much protein, carbs, fats, dairy, and fiber your dog should intake. Use your best judgment and observe how the pup behaves after you’ve incorporated these foods. Dogs should get a minimum of 10 percent of their calories from protein according to the National Academy of Sciences. 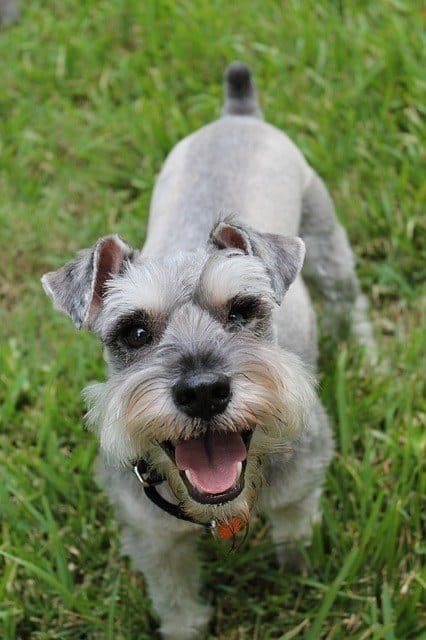 Miniature Schnauzers get about 10 essential amino acids from protein. These are essential and necessary for their health. Protein provides all they need for survival so feed your hound with eggs, meat, poultry, legumes, fish and soy. Still, make sure to keep this within some boundaries. Too much protein can be equally as bad as too little so consult your veterinarian about how much should you include in the pup’s daily diet. For instance, if your dog is more on the elderly side with kidney problems, then it’s better to have them on a low protein diet. According to NAS, a balanced diet should consist of at least 50% carbohydrates. Carbs should come from legumes, plant goods, and cereal grains like barley, oats, and rice. Wheat is something you should avoid since it can cause weight gain and most dogs are allergic to it anyway. Miniature Schnauzers tend to develop skin issues due to food allergies and the cause for this is almost always some kind of wheat product. Dogs should have at least 2.5% to 4.5% of the fiber in their diet, according to NAS. Fiber is incredibly vital for your pup so it’s something you should take seriously. The best way to include it is by feeding your pup with fruits and veggies. Though many fruits and vegetables are off limits for dogs, some are still quite healthy for hounds. They get some of their energy from fiber, but it also helps their digestive tract to function without any issues. Fiber is also available in the form of supplement, but you should consult your vet about it. Meat fats and those from nuts and seeds provide fats and fatty acids your dog needs. Fats provide energy for your pup and help cells function normally. They also prevent dry skin and help keep both skin and fur healthy. Omega-3 fatty acids help with eye function and learning abilities. Fats should include about 5% of the diet, and you can even add fish oil or olive oil as supplements. However, this is something you should only do if your vet recommended so. 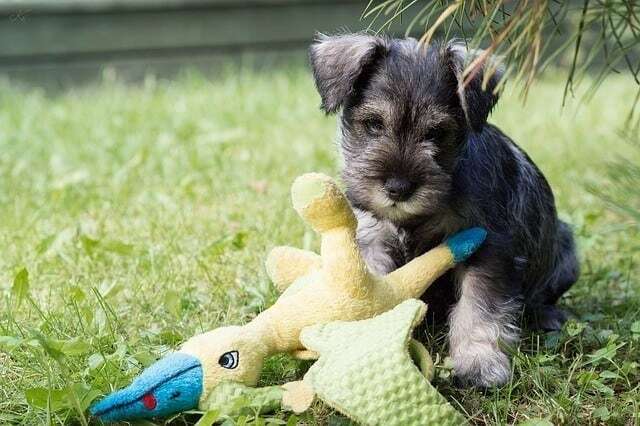 Miniature Schnauzers are prone to pancreatitis that’s an inflammation of the pancreas. It’s because they have high levels of lipoproteins. All dogs need vitamin D and calcium for strong teeth and bones. For this, you can feed the canine with some dairy like small bits of cheese as a reward and treat. It’s a great way of avoiding commercial dog treats while also including some calcium in its diet. 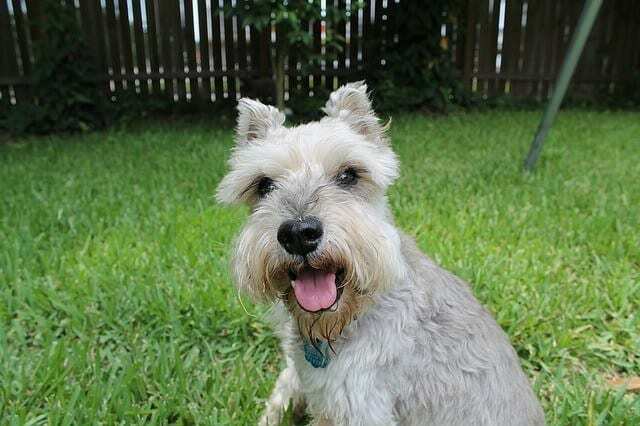 Male miniature schnauzers tend to end up with Oxylate stones in their bladders. This happens due to high calcium levels so make sure to use the cheese treats with care. They do need calcium but only small amounts of it. 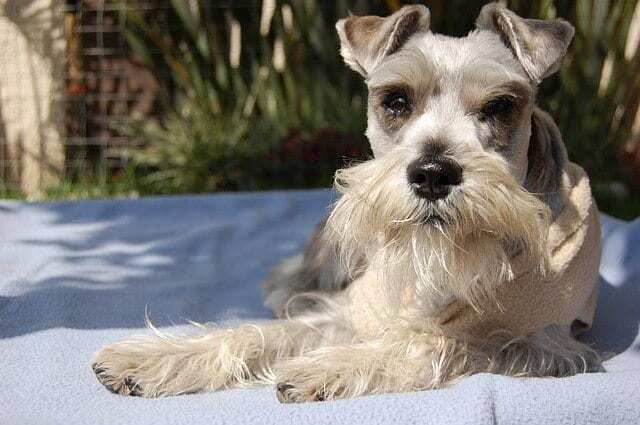 This is a tailor-made nutrition diet for miniature schnauzers is one of the best options for them. It promotes healthy skin and fur, and it brings many other benefits significant to your hound. Royal Canin designed this kibble especially for this breed since it has a unique scissor bite and a moderately blunt muzzle. These are now easy for them to pick up and chew, unlike regular kibble. This is a rich diet made exclusively for miniature schnauzer adults, so it’s rich in vitamin A, EPA, and DHA fatty acids. This help protect skin while the amino acids improve the health of the fur and its intense color. It’s a balanced formula that will keep your canine slim and active. As long as you stick to the recommended amount, your pup will maintain its ideal weight. This is for adults that are 10 months or older. It’s designed especially for them, so it shouldn’t be fed to puppies. Orijen is well-known to be among the best dog foods on the market. It’s also suitable for miniature schnauzers as it’s rich in all the ingredients the breed needs. 1/3 of the meats used are from dehydrated chicken and turkey. There aren’t any rendered poultry meals. The food has about 38% of nourishing protein and 20% low-glycemic carbohydrates. It’s meant for adult and senior dogs only. The food is prepared without cooking, so it retained all the natural and nourishing protein, fats, carbs, etc. Because it’s so nutrient-dense, you don’t have to feed a lot of it to your dog. This means that a bag of Orijen food might last you longer than a bag of some other food. We recommend you read our acana vs orijen dog food comparison guide as well. As we go a little more in-depth with this brand, and also you can see how it compares to another product. This one comes in different flavors so you can choose between whole herring, chicken heart, chicken liver, turkey, and many more. The food comes from a family business in Wisconsin. It’s a recipe that promotes healthy digestion thanks to the percent of fiber from pearled barley, rice, and oatmeal. It’s important to note that this food is enhanced with probiotics that further help with digestion. It also contains salmon oil for healthy fur and skin. Other crucial ingredients are taurine for heart and eyes and chicory root that reduces the risk of worms. It’s completely free of wheat, so it’s safe even for allergy-prone dogs. It contains calcium that promotes healthy and strong teeth and bones. With 26% of protein and 17% of fat, this is one of the best choices for adult miniature schnauzers. You can choose between chicken, oatmeal, duck, brown rice, pearled barley and many more. If you’re looking for a gluten-free and grain-free diet for your dog, this formula is one of the best options. It’s completely free of grain and balanced for everyday use for your mini schnauzer. The formula is rich in protein as it’s made with premium chicken and turkey. It has optimal levels of calories that support different energy levels of small dog breeds. The best thing about it is that it’s natural. It contains only natural ingredients and no soy, corn, wheat, and meat by-products. It also doesn’t have any added flavors, preservatives, and artificial colors. Wellness Core is a USA brand that guarantees their food is quality and suitable for all stages of adulthood. The formula comes in a pack of 4lb. and 12lb. 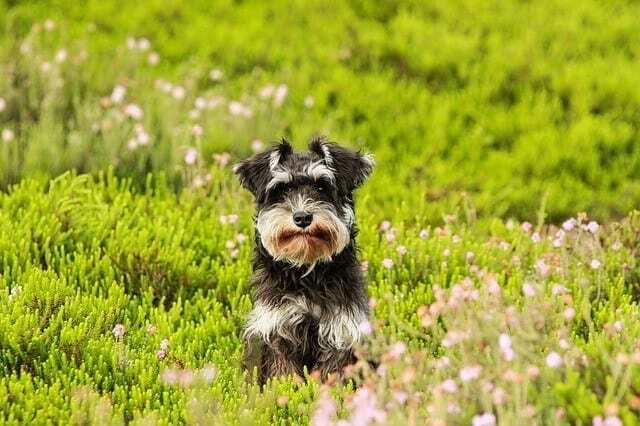 It’s rich in vitamins, and all of their kibbles are quite small, so breeds like miniature schnauzers no longer have to struggle with big bites. This is another grain-free option that’s a bit more suitable for mini’s that have sensitive stomachs. It’s a unique formula that promotes healthy digestive support. The kibble is on a smaller size so smaller breeds can eat with ease. The diet is completely grain-free, well-balanced and provides all the nutrition your canine needs. The important thing is that it doesn’t contain any meat by-products, artificial colors, preservatives, fillers, flavors, corn, or soy. Also, this kibble is rich in fruits and vegetables, so it’s ideal if your mini has a sensitive stomach. Protein and fat levels are balanced to support the needs of smaller energetic dogs. It’s suitable for all stages of adulthood, but make sure that the hound is 10 months or older. As most adult dog food, this one isn’t recommended for pups. Only a pack of 4lb. Much like the Fromm’s Adult Gold formula we discussed above, this one doesn’t contain any wheat, soy, or corn. It’s just as quality, but it’s formulated especially for growing puppies. It has correct calcium to phosphorus ratio that’s suitable for pups. Also, they’ve included DHA-rich salmon oil that helps with eye and brain development. Other main ingredients are chicken, chicken meal, duck, oatmeal, and pearled barley. This is one of the most quality puppy foods you can get for a miniature schnauzer. All of the ingredients used in the process are fresh and delivered to the manufacturer each morning. Not only it’s suitable for growing puppies, but the Fromm Puppy Formula is also recommended to pregnant and nursing mothers. 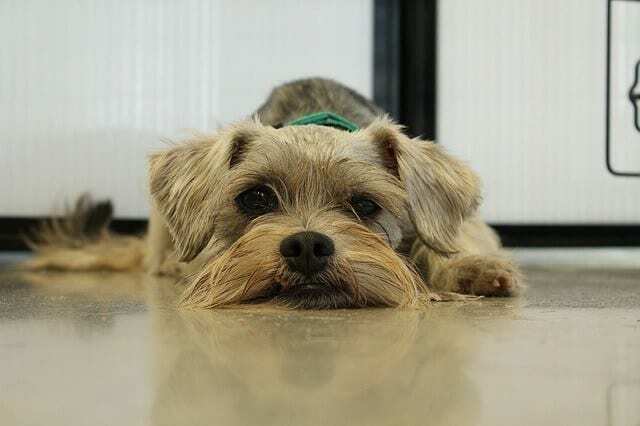 It’s a great choice if you’re looking for quality food that improves your pup’s general health and helps it develop into a healthy and energetic mini schnauzer. Orijen Puppy food is made with free-run turkey and chicken, wild fish and nest-laid eggs. It’s rich, nourishing and ideal for growing puppies. It has 38% of protein and 16% or low-glycemic carbohydrates. 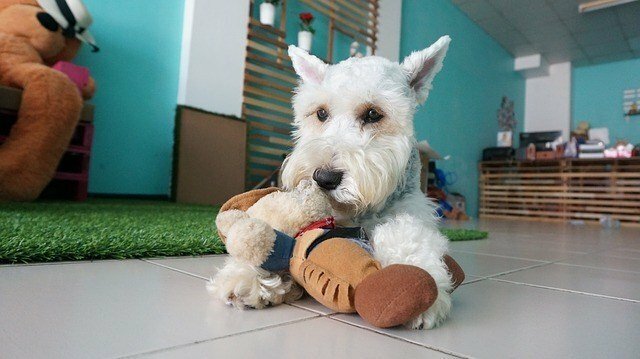 For this reason, it’s suitable for miniature schnauzers as well as other small breed puppies. It’s free of rendered poultry meals and instead contains 1/3 dehydrated chicken and turkey meats. The manufacturer uses fresh meat that doesn’t contain any preservatives, so the food is natural and healthy. It’s recommended to pregnant and nursing mothers as well, but make sure to consult with your vet before you start the diet. This formula promotes healthy growth and is suitable for all puppies regardless of their energy level. Purina is one of the best choices if you’re looking for a balanced and nourishing diet. Their dry food comes in many flavors and sizes, so it’s easy to choose based on your needs. It’s made with high-quality protein with real chicken being the main ingredient. It also features DHA from omega-rich fish oils that help with eye and brain development that’s always crucial in those first months of life. Their formulas are rich in antioxidants and help puppies develop a strong and healthy immune system. It’s recommended to puppies that are under one year old. The kibble is small enough so puppies can eat it without any issues. It’s a gentle formula that’s suitable for your pup’s sensitive stomach while it’s also recommended to pregnant and nursing miniature schnauzers. Pups usually have sensitive stomachs, so it’s best you look for something gentle and easier to digest. Merrick is known for quality food for both big and small breeds, puppies and adults. Their puppy recipe is grain-free and has no gluten, so it promotes easier digestibility. The number one ingredient is real deboned chicken, and all the food is cooked in the USA. Added DHA helps healthy vision and brain development that’s crucial in the early stages of your pup’s life. This makes the food also suitable for small breed females that are pregnant or nursing. It’s formulated in a way to support all development and nutritional requirements of all puppies and breeds. However, you should only feed it to your hound until it turns one year. This recipe contains sweet potato, real farm-raised chicken and brown rice. It’s tailored in a way to help your pup’s unique needs since its diet should be different than that of an adult dog. It contains Omega-3 fatty acids like DHA that promotes and helps healthy brain and vision development. This ingredient is crucial in puppy food since the first years of life are the most important. The food also contains calcium for stronger joints and bones. All the ingredients used are non-GMO and healthy for your pup’s development. The Nutro Wholesome Essentials is suitable for all breeds but is especially recommended to miniature schnauzers that are younger than one year. You can feed it to nursing and pregnant mothers, too, regardless of whether the breed is small or big. Females should weigh from 12 to 18 lbs. or 5.4 to 8.2 kg, while males should weigh from 12 to 20 lbs. or 5.4 to 9.1 kg. This is optimal, and numbers may vary depending on your dog’s activity level and general health. The amount of food you should feed to your mini depends on many things. You should consider the dog’s age, size, activity levels, as well as the quality of the food you’re using. Read the labels to see what the food manufacturer recommends. The quality has a lot to do with the size of the meal since different ingredients vary in nutrients. Also, think about how active your hound is. Young ones should have about 1/3 to ½ cup of dry food two times a day. You should feed an 8-months old puppy 3 or 4 times a day with ¼ of a cup. Stick to the amount that’s recommended for the specific food you’re using. However, make sure to keep a close eye on your dog especially in the first few days you introduce the new food. In these early moments, you’ll notice if you’re feeding the dog too much or too little. Overfeeding a schnauzer can cause many different problems, so it’s important to approach this with attention. Though there’s a recommended cup-per-day on every dog food package, note that all dogs are different in their activity levels and overall needs. This breed can suffer from epilepsy, allergies, diabetes, and pancreatitis. However, the most common problem of the minis is that they tend to develop different types of bladder stones such as struvite and calcium oxalate stones. Bladder infections cause struvite stones while calcium oxalate stones appear when the body mishandles calcium. 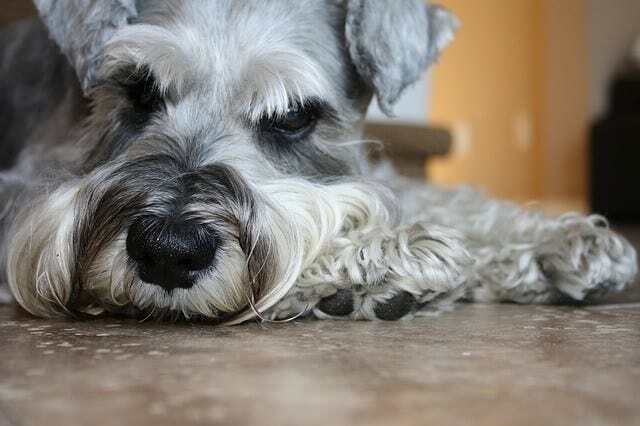 Mini schnauzers also tend to have portosystemic shunts, which is actually a liver defect. This can only be treated with surgery that’s quite expensive. Some dogs may even have a genetic disorder called myotonia. Puppies that have this condition usually have hyper-excitable muscles that contract. The dogs struggle with simple things like getting up and walking as they grow and their disease progresses. A DNA test of the pup’s parents can tell if they carry the gene, so only buy a puppy if you’ve seen a document that shows these tests have been done. Miniature schnauzer will most likely eat any food that falls off the table, but too much of it can be a problem. It’s okay to mix some vegetables and meats with regular kibble but only if the food isn’t seasoned or salted in any way. Sweets aren’t recommended, and you should also avoid raisins, onions, grapes, and any spicy food. If you do give it some leftover meat, make sure to remove all bones as those can hurt your dog’s stomach. Healthy Soft Chewy Dog Treats by Healthy Breeds is one of the best healthy treats for miniature schnauzers. It’s a grain-free and gluten-free formula of mixed vegetables, fruits, and meats. It contains only 4 calories per treat and is ideal for allergy-prone pups. 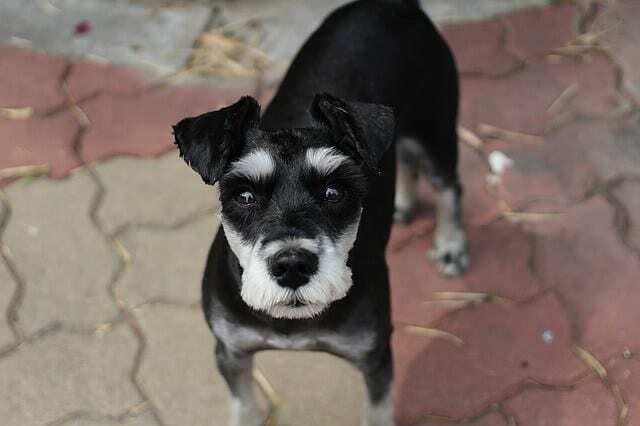 Miniature Schnauzer is a loveable breed, ideal for both large and small families. The dogs love children and are easy to adapt to life in a house or an apartment. However, much like all other breeds, it demands attention and special care. Healthy nutrition is probably the most critical aspect of your dog’s life regardless of its age so it’s something you should take seriously. Luckily, many reliable dog food brands make wet and dry foods for miniature schnauzer adults and puppies. The wide range of choices makes it that much easier to keep your pet’s diet healthy and fulfilling. Pick the type of food you think your pup will like the best and make sure to introduce it slowly. Keep in mind all dogs are different, even those of the same breed, so take your time and learn from the way your hound behaves.